Advanced Engineering 2016 reported a record-breaking number of visitors globally. 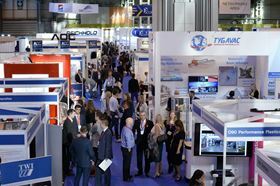 UK 3D printing and innovative technology show Advanced Engineering 2016 reported a record-breaking number of visitors globally. ‘Once again we have seen fantastic numbers walk through the doors, but importantly, not only have we had quantity, but also the level of quality visitor has remained very strong this year,’ said Matthew Benyon, managing director at Artexis Easyfairs UK and Global. Advanced Engineering also hosted the largest open conference of its kind, providing visitors with over 180 hours of case studies, supply chain opportunities, and market sector outlooks over the two days. The next Advanced Engineering UK will take place on 1 and 2 November 2017. This story is reprinted from material from Advanced Engineering, with editorial changes made by Materials Today. The views expressed in this article do not necessarily represent those of Elsevier. K 2016, the international plastics and rubber industry reportedly welcomed 230,000 trade visitors and 3,285 exhibitors over its eight days. Composite reinforcement specialist Kordsa, based in Turkey, reports that it received a record number of patent applications.